Want a better relationship with your cat? Are you at the end of your rope, ready to kick the cat out? How to Make Your Cat ADORE You? First, I have to warn you: These techniques really work, so be careful what you ask for! If you want your cat to adore you, you must first adore your cat. If Kitty falls in love with you after you learn to follow this "courtship" plan, you had better be willing to have a 'feline fan club' - even if there is only one cat in it. You don't want to make her love you then let her down with a betrayal if you change your mind. I am surrounded, as I write this, by 20 cuddly cats who adore me. They keep me warm at night and reward me by day with their loving attitudes. They entertain me with their cute antics, and they touch my soul with their purring and those loving eyes that would melt the hardest heart. They follow me around the house as if waiting for their next assignment. They don't make as many messes anymore, and finally, I can stop worrying about the couch being shredded. Never has life with cats been more rewarding! I couldn't do that to him, because I loved him. (He has since died of old age, but I still think of him often.) I felt totally inadequate to change his bad behavior. How did my friends manage to keep their cats happy? Why couldn't I figure it out? I was miserable... and so were my cats. But then something happened that changed everything -- luckily for me, and very luckily for my cats. I went on vacation for a month. When I got back, I was stunned to discover that they were traumatized by my absence! They were angry, nervous, wouldn't eat, cried constantly for about 3 days, and wouldn't come near me, glaring at me from a distance. OK, it finally dawned on me -- they missed me! That could only mean one thing: Cats have feelings. Amazingly, I did not know that until now. Like most people, I thought cats were.... just cats! Furry, fun, frustrating at times, but... just cats. But now my reality had been shaken. Well, if they have feelings, and I hurt them, could that explain bad behavior? How could I have missed this important knowledge? The answer was very simple, really. It was right there in front of me all the time. And now I would like to share the secrets I discovered ... with you! Because I am a cat rescuer. I run a shelter. If you could spend a day with me, it would break your heart to see all the cats no one wants anymore because the unrealistic expectations their owners had didn't work out. People throw their cats away to the tune of several million a year ... and there is nothing wrong with them! Every day I look at dozens of sad little faces ... cats who are wondering what happened to their owners. Every day they ask me if today is the day they get to go home. But I have to tell them no, not today, honey. Not today. But maybe we'll get lucky tomorrow and someone will want you again. And if we're really lucky, they will already know the secrets of a great relationship with a cat ... the secrets I tell you in my book, How to Make Your Cat Adore You. Sadly, not many people know these things. So, if I can teach you how to make life more rewarding for you and your cat, then I can truly save them, and I won't have to do it by sheltering them and finding new homes. I just finished reading your ebook... I found your writing and info to be thoroughly interesting and helpful. I especially like your words on love, communicating, and seeing the world from my cat's point of view. You are helping me think beyond my orthodox world view. Thank you. 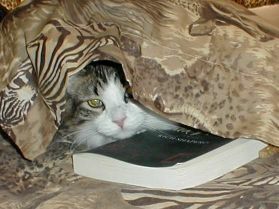 I have found few writings on the cat world and would like to develop a place for not just [animal training] books but better understanding and loving them in ways that are most helpful to them. That’s what I really liked about your writing. You helped me see more of us through [our cat] Biggie's eyes. I could feel your kindness and love for your cats through your words. Nice. Hello Roberta, yes I read your e-book and it was wonderful. About three months ago I purchased a Bengal kitten. I already have two cats that have been with me for almost 12 years. 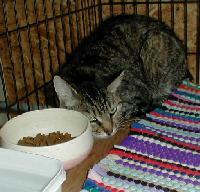 I picked out both cats from spca but as you would proubly figure both cats picked others in the household to bond with. I told myself I am going to learn a little and really work on the Bengal to form a bond. Your e-book helped and taught me the things I need to know. I have been working with the Bengal now for several weeks and it seems to be paying off. Keep up the good work. Does this sound like your cat? Aloof ... He doesn't seem to care about you. He just wants you around when it's time to eat! Aggressive ... If you try to pet her, she growls or hisses, or even tries to bite you! Bored ... He won't play anymore. He just lays around the house, leaving clumps of fur on the couch. Disgusting ... She urinates behind your chair, or in a corner you can't reach! Destructive ... He has shredded your favorite chair! Messy ... She gobbles her food like there's no tomorrow, then throws it up on the best carpet in the house - never in a room with linoleum! Disgusting (again) ... He left you a "present" on your pillow! Are you ready to throw the little ingrate out the door? Are you ready to take him to the shelter? Did you already give him up? You buy him nice food, nice toys, a great bed, and he gives you the bum's rush anyway! Are you frustrated, or what? Is it time to fight back? Show him who's boss? Give him what he deserves? What if I told you he deserves another chance? Every night I try to spend at least 20 min playing with (our new kitty) and am using the techniques you mentioned in your e-book. Last night we were playing in the floor together and she walked about 6 feet from me, turned around and laid down. She then looked right into my eyes and I saw a look that I had never seen before. The eye contact was so amazing, I cannot describe it. With no fear whatsoever, and never taking her eyes off mine, not even blinking, she got up walked over to me and touched her nose to my nose. She has never done that before. It was a great feeling. I have one of the older versions of your book, "How to Make Your Cat Adore You" (second edition), and I would love to get a copy of the latest version. I think reading your book helped me realize how sensitive my cat is and how I needed to pay more attention to her. It also made me realize how our "upbringing" of her (we've had her since she was 8 weeks old) has molded her into the kitty she is today. I enjoy getting your Kitty Times (newsletter) each month. It is one of the few e-mails I receive happily and eagerly open and read right away. I love, love, love your e-book! I've just printed it for me to read and then my daughter who was reading over my shoulder. Please turn it into a real live book. It will sell well, I'm sure. Just want to let you know that I've read your book and just within two days of implementing your principles, I've received more rubs from my cat than I've had in a long time. I love my cat, and he's very well treated at our house. Lately, perhaps due to stress, I've been feeling that maybe my cat doesn't love me. But now things have gotten much better, all within a few days! I'm so glad I came across your book - there's not that many out there on communicating with your cat, but actually we really need them because we can't speak "cat!" 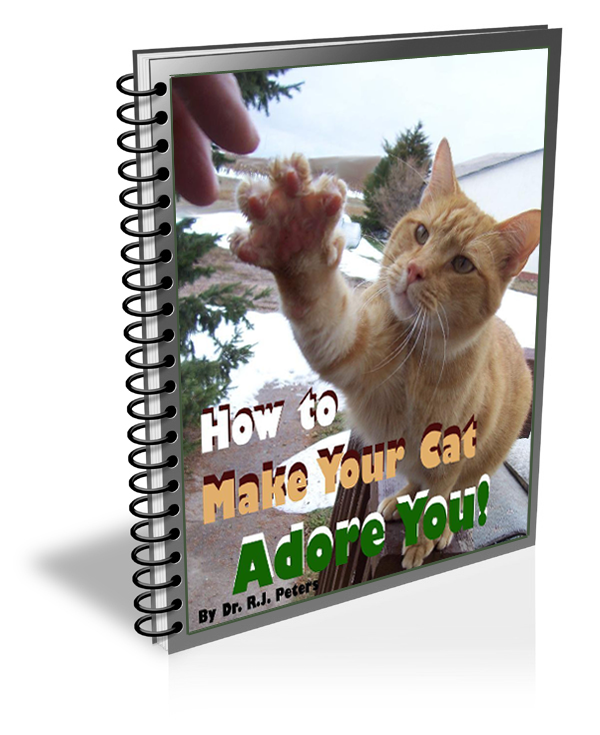 I am halfway through "How To Make Your Cat Adore You." I am really enjoying it. I also love your style of writing (wish I could express myself like you do). I will be 'getting to know' my kitties this coming week. And yes, I will keep you posted! Thank you so much for the new book! I love your information and your newsletter. I LOVE your book and am telling my friends about it! It's wonderful! Your information is so helpful...and it's also totally right-on! Or is it time to try a new approach? I used to beat my head on this wall, too. I could never throw any of my cats outside, but I finally got used to co-existing with some of them. You know ... like a roommate or spouse after a fight? You go about your business without talking to each other ... ignoring each other ... avoiding eye contact ... barely acknowledging their presence? Is that how you're feeling right now? Relax. I learned how to handle these problems ... and so can you! And because I love cats, as I know you do too, I want to help you make it work, for you and for your kitty. Would more people keep their cats if they knew how to change things? Since I discovered these secrets, everything is different. My cats all love me, and I love them. Purr a lot ... oh, did I already say that? But the best part is, you can see results almost immediately. It depends on the cat, but most respond quickly to the loving techniques I outline in my new book. I have always been interested in helping people and their pets learn to live happily together, and have dedicated my life to saving as many pets as possible through rescue, but more importantly, through education so people can rescue their own - by not having to relinquish them. How to get this book: Click here to choose your preferred format at Amazon. Notice: If you experience any problems with the ordering or download process for the ebook, please email me for assistance. If you experience any problems with the Amazon or Kindle ordering process, you will need to contact them, as I have no control over their system. Thanks!